We will work with you to define your career goals and help prepare you for your future. The discipline of pharmacology is oriented toward the study of the interactions between drugs and biological systems. Included among such studies are determining the nature of drug-receptor interactions, examination of the intracellular responses to receptor activation, the evaluating effects of drugs and transmitters on biological entities ranging from cells to whole organisms and discovering new treatments for diseases. As such, pharmacology encompasses a large variety of research techniques which provides for a wide range of career opportunities. The American Society for Pharmacology and Experimental Therapeutics (ASPET) provides an overview of the fundamentals and applications of pharmacology in its brochure, Explore Pharmacology (PDF). Depending on the primary area of interest to the investigator, employment is possible within such academic departments as anatomy, biochemistry, biology, immunology, microbiology, pharmacology, pharmacy, physiology, psychology or psychiatry. Rewarding careers are also possible in drug companies, government laboratories and government agencies. Among the relevant government agencies are the Center for Disease Control, the Federal Drug Agency, the Department of Agriculture, the Department of Defense and NASA. Opportunities also exist in areas involving the development of public policy, investment counseling, patent law, science writing and science editing. Such flexibility affords a host of options for rewarding careers. Graduates of the program have either remained within academics by securing postdoctoral fellowships in prestigious laboratories, two of whom now have faculty positions, or obtained jobs in such industrial concerns and Mallincrocdt, Procter & Gamble Co. and Eli Lilly & Co. Further information is available from the American Society for Pharmacology and Experimental Therapeutics. Traditionally, toxicology has been thought of as the study of poisons. Today the increased awareness of the potential harm from substances in our air, food and water has generated tremendous interest in toxicology research. Society wants to know if these chemicals are really dangerous and what levels are safe. Toxicology combines the elements of biology and chemistry with many other disciplines to help us understand the harmful effects of chemicals on living organisms. Toxicologists have many opportunities, including research, product safety evaluation, teaching and regulatory affairs. The demand for toxicologists has never been higher. There are opportunities in chemical and pharmaceutical industries, government, the professional services industry, as well as state and local governments. Salaries are comparable to other science-based professions. There is potential for rapid advancement due to the importance of this discipline to the general public, the pharmaceutical industry and regulatory agencies. Further information can be obtained from the Society of Toxicology web site. Know what is expected of you. Graduate students are treated like members of the laboratory and are expected to be in that laboratory when not in class. The average start time is 8:30 a.m., ending at 5:00 p.m. If your project warrants more time in the laboratory you are expected to adjust your schedule to compensate. The breaks in courses, between quarters (or semesters) are the best times to get work done; you can focus more on your project without the distraction of classes. Plan on continuing your time in the laboratory over holidays and summer breaks. This will also insure your ability to complete your project on time. Students complete 3 laboratory rotations in their first quarter with the goal a picking a laboratory to complete their research. An agreement is made between the primary investigator of that laboratory and the student, and the student begins work with that faculty member that will culminate into a defendable research project. We try to have a diverse class, with students from different areas of strength. It is a good idea to form study groups and work together during your first year. 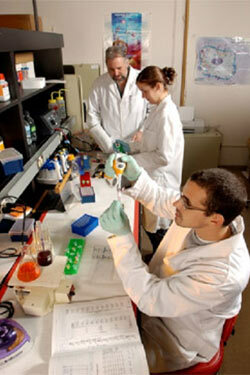 Start working on your thesis as soon as you go into a laboratory. Keep records of everything you do, equipment you use and start on your background information right away. Talk to the second year students, they can offer advice on courses, thesis work, and help make you a better scientist.